This November's Art Elements Challenge is to interpret stars as you see them, in astrology, Celtic art, magic, beautiful quotes to live by, decorative arts, jewelry, painting... the list is endless and the media is wide open. I thought about each idea and breezed right past beautiful quotes to live by when I read the challenge the first time. On the second reading, I thought about some of quote beads that I just got from Grubbi Ceramics. I remembered that I had some quote beads as well as some of her nautical beads that would be just perfect for this because these beads included some of her starfish as well as quotes that would work with them. 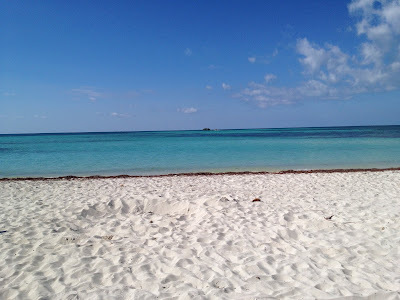 For inspiration, I have lots of my photos and memories of beaches from many different locales to pull from. The variety of blues in the ocean never fails to amaze me. I love to create ocean inspired pieces with a palette of blues, whites, and beige. I selected a quote bead that reads "in the open sea my soul is free". 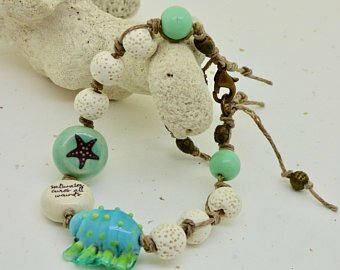 I combined a ceramic sea shell, a starfish ceramic, anchor bead with the quote bead to create the focal of the bracelet. The turquoise blues and greens in the bracelet are used to give this message bracelet a bohemian beach feel. Natural Irish linen thread was selected for the casual feel it creates. The color also helps to add the beiges of sand. This ocean inspired jewelry is sized to fit a 7 to 7.5 inch wrist. If you need to have the size adjusted, just convo me. For the next message bracelet I used a quote bead "saltwater cures all wounds". I added a ceramic sea shell, star fish ceramic and a word bead. Turquoise blues, greens, whites in the bracelet are used to give the bracelet a bohemian beach feel. I added some white beads that remind me of white coral. Natural Irish linen thread was selected once again to add the color of sand and to give the bracelet a casual beachy feel. This beach inspired jewelry is sized to fit a 7 to 7.5 inch wrist. 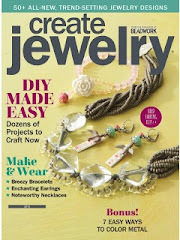 I can't wait to see what all the participants in this blog hop created. Very pretty! 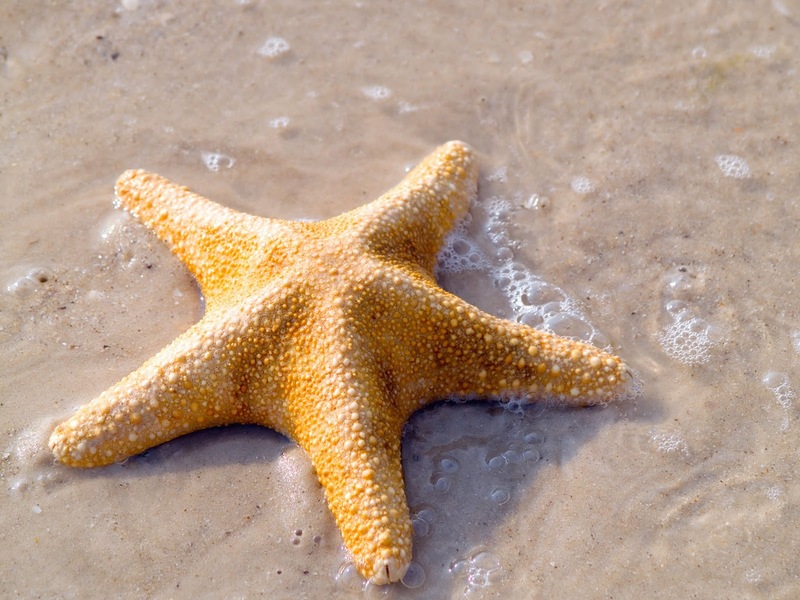 I love starfish and I love your interpretation of the topic! The color palette is so beautiful! Sea and beach are an unbeatable inspiration combo, right? The turquoise (recycled glass?) beads in the first bracelet make it my favorite! Now I am wondering why I did not think of Starfish as the inspiration for this theme. Haaa. For you have made a simple theme very interesting with the usage of quotes. I love your bracelets! They have such a beachy feel to them. 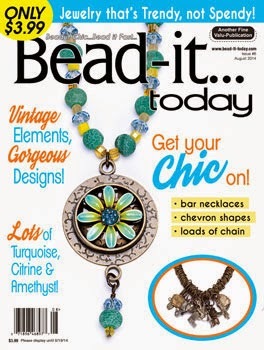 The quote beads are fabulous and your choice/color of coordinating beads are just perfect. I love that you took the star theme down the starfish route. Lovely colors and quote and now I want to go to the beach! 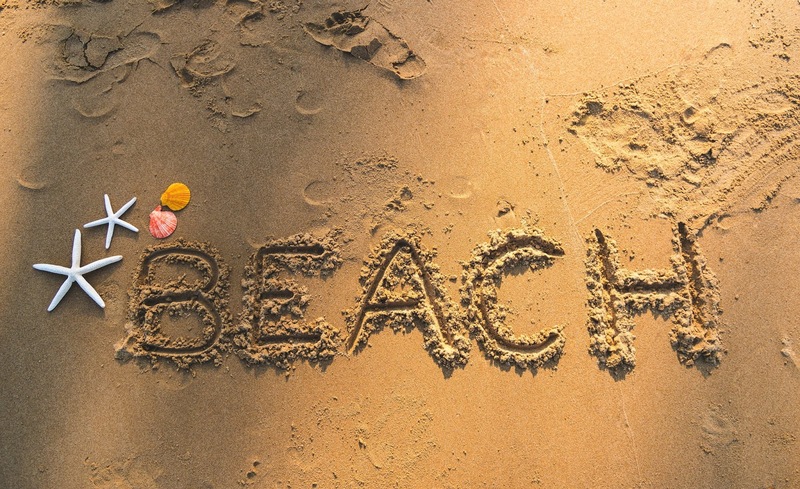 Although, anywhere but a midwestern winter sounds good right now ;-) Thanks for participating in another challenge! They're both stunning, I love the knotted linen. 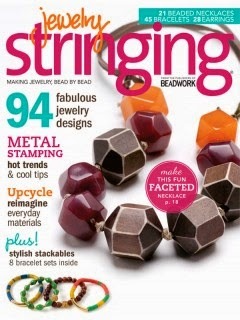 It reminds me of fishing nets and is the perfect match for your theme. Oh these are really lovely Kathy, I am totally in love with the first one the colours are just perfect! 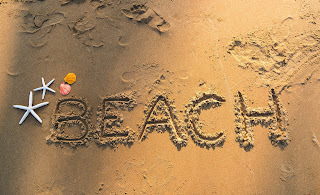 Now how did I guess that you'd do some beachy designs this month? ;) Your bracelets are both super cute... that first one is just to die for!! 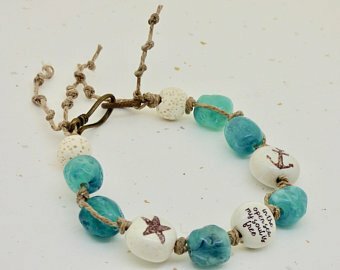 Awesome bracelets, love your interpretation of the theme - since the sea is so you! 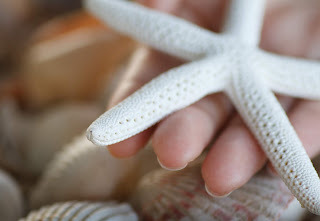 LOVE, LOVE, LOVE your beachy take on a star theme. That first bracelet is dreamy with that teal and white. I dig it! Thanks for giving me a taste of the beach in this chilly weather. The colors you've chosen are amazingly soothing! I love the casual, beachy theme for these bracelets. Kathy, I see you have the same fave color palette as I do! 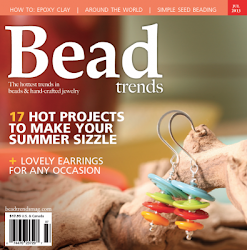 Your bracelets are amazing, great bead choices and colors. How in the world does the artist get all those words on one tiny bead??!! 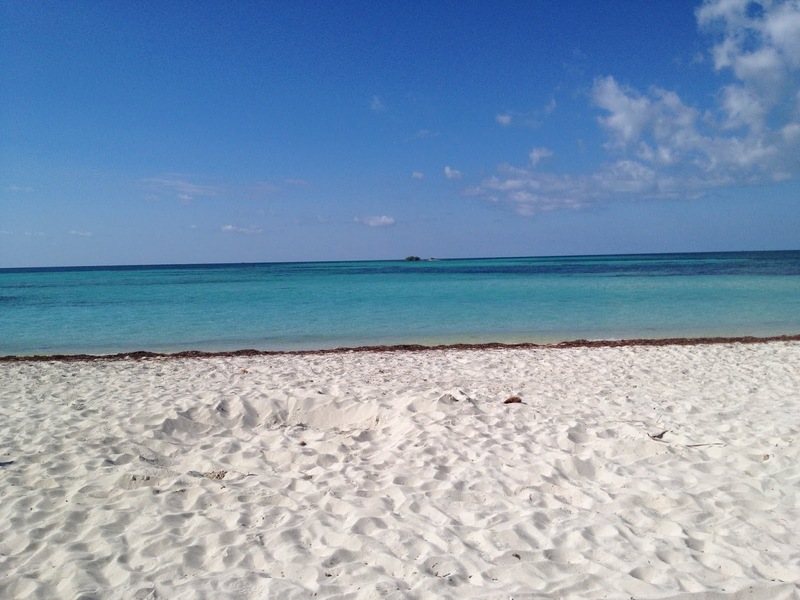 Kathy - I love how your heart and inspiration are so connected with the ocean! These pieces are stunning!!! Your bracelets are beautiful. The combination of colors and materials is perfectly beachy.